Students from all over the world want to travel and study abroad to visit a new region, to try the authentic local cuisine, to meet new people and become fluent in another language. Others want to take advantage of education opportunities, courses, and experiences that only a foreign university can offer. However, how do you make the most of your overseas experience and integrate yourself into the local culture? In this article, we will discuss five quick tips on how to make the most out of your study abroad experience. The primary reason for international students to study abroad is to learn skills and obtain a degree. Therefore, having a study schedule with all the essential dates is a good idea. It will help you to prioritize your study time and stay organized. However, it is also important to give your brain a break and do something that you enjoy. The best suggestion is to make the most of your study time, to avoid cramming during an exam period. Plan ahead to give yourself consistent time to study every day. It is encouraged that international students seek out new opportunities and join clubs while studying abroad. Many universities have plenty of student clubs, athletic activities, and groups available to new students. From there, you may have a chance to continue your hobbies or discover some new interests. You may meet some new friends who are from your native country or those from the local region. Immerse yourself in your new country as this should help you integrate into your new offshore student life. The priceless relationships you developed with your friends at university can be a lifelong connection – and it may just help your career. One of the advantages of being an international student is being able to experience the local culture. Many universities have homestay programs, of either short-term or long-term periods. This may give you a chance to experience the day-to-day life of the local people, to learn cultural differences, and to overcome the language barrier. A homestay arrangement may also save you money as local residences and apartments will probably be quite expensive. Home cooking from a local homestay house may also be a great feature. Facing challenges and stress when studying abroad is quite normal. However, if you don’t handle it well, it can have adverse effects on your performance. If you need positive support and help, it is encouraged to ask your teachers or supervisors and talk to them about your stress. Keep regular breaks, exercise daily, and spend time with your friends. You should check if your health coverage will pay for claims associated with mental illness. If you are studying abroad and traveling often, it is imperative to obtain the appropriate health insurance plan. 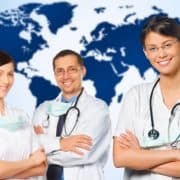 Although many colleges, universities and educational institutions will offer some international health insurance plan, the coverage may be basic or only cover you in your destination country (not back home). Moreover, the university coverage may not include your overseas travel. To learn more about international student health insurance, please click here to learn more about the great plans that we can offer students. Feel free to contact us to discuss your student health insurance requirements so we can make a recommendation that will fit your needs. If your overseas education facility would like to consider offering a plan for its students or even the expatriate staff, please contact us to discuss a group plan. For more information, please click here and obtain our one-page international student health insurance brochure.